With so few buttons and dials, the camera is, by necessity, largely operated via the spacious touchscreen on the back. Samsung's own default camera app puts all the expected controls at your fingertips — although it's curiously unsuited for quick and convenient operation. In use, the Galaxy NX really is more like a smartphone that you can put a big lens on than a mirrorless camera built around a touchscreen interface. It's a bit of a nice distinction, so I'll be more specific. 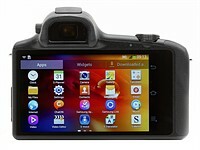 The Samsung Galaxy NX is mostly controlled via its 4.8-inch touchscreen. The camera interface is about as capable as any point-and-shoot with a touchscreen display. There are nods to touch-centric design here and there, but it still feels like something that could easily be operated with a directional pad. 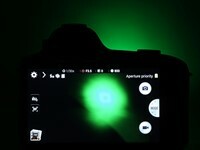 For example, changing the ISO or shutter speed involves hitting a tiny rectangular target at the very top of the screen, while displaying filters requires pressing a tiny up arrow at the very bottom of the screen. You will almost always hold the camera by the grip, since holding it any other way will likely lead to accidental activation of the touchscreen. That means that your thumb is always just to the right of the screen. 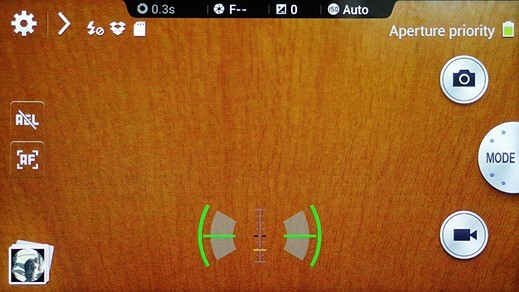 But instead of placing a variety of tools at the right side, there's only a virtual mode selection dial and buttons to capture a still or video. If you've used Samsung's flagship Galaxy S4 smartphone, you'll understand just where the Galaxy NX's user interface came from. The camera apps are almost identical, despite being intended for completely different styles of device. It seems Samsung suffers from a lack of imagination here; a DSLR device should have necessitated more intuitive functions and gestures tailored to the camera user's needs. The pedestrian interface nags at one's mind when considering the $1,600 body-only price tag, but in practice it doesn't get too much in the way of snapping pictures. One of the best things about shooting with a big smartphone is the bright, high-resolution screen — all of a sudden the lure of an optical viewfinder isn't quite as strong. It's no different on the Galaxy NX: the screen feels gigantic and is a perfectly usable way to frame shots. The color is decent, but the resolution isn't the best: 1280x720 on a 4.8-inch screen means you'll notice visible pixels both in text and in image previews. However, that's comparing this device to a high-end smartphone, on which the screens are generally amazing, and not similar cameras which offer rear LCDs that are generally little more than adequate. Unfortunately, the EVF isn't quite as good. 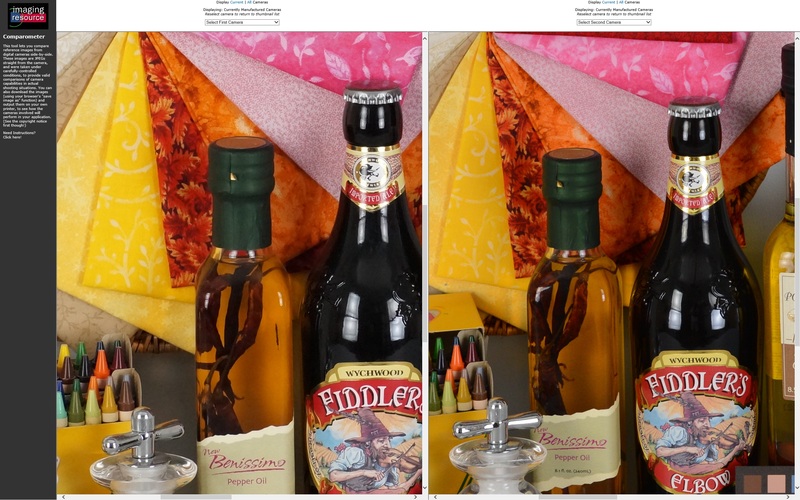 Having been spoiled by the similarly-priced Olympus E-M1, I found the Galaxy NX's eyepiece rather dull and laggy. It works, but feels unnecessary when so much of the camera is invested in a powerful rear display that's generally bright enough to use in daylight and is, in fact, more convenient. The main dial, once set to the not-so-helpfully-named "Option 3," allows for fairly easy thumb adjustment of a number of settings while using the electronic viewfinder, or if you're otherwise unable to use the touchscreen for that purpose. The dial feels good and the spiky finish is pleasantly grippy.